If you drive along County Road H in Barronett, you might see an old dairy barn. If you go inside, what you’d find are tools and wood, not cows and hay. The barn is the workshop for Phil Odden and Else Bigton, a husband and wife wood carving team. Phil and Else live and work on this farm that has been in Phil’s family for many years. 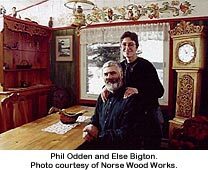 Else and Phil have been wood carving in traditional Norwegian styles as a married couple for over twenty years. They make big items like beds, fancy items like chandeliers, decorative items like ale bowls (traditional, Norwegian drinking bowl), and useful items like wall cabinets. Even though they work together as partners in the same shop, they work separately on their own projects. When Phil was a boy, he knew his ancestors were Norwegian. He never planned to make his career focus on that but it happened anyway! 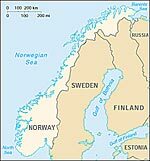 When Else was a girl, she grew up in Norway. She planned to be a weaver like her mother but then began to work with wood instead. Phil and Else are Norwegian-Americans and so are the people who most love their work. Many Norwegian-Americans like to have crafts made in Norwegian styles because they are proud of their heritage. There are many Norwegian-Americans in the Midwest because their ancestors settled here when they emigrated from Norway in the mid-1800s. The wood carvings that Else and Phil make are very popular with Midwestern Norwegian-Americans. They buy so many that Else and Phil can support themselves and their son through their wood carving business, Norsk Wood Works. Else and Phil love what they do and love making so many other Norwegian-Americans happy through their art.